Try our Natural Gemstone Bead Necklace Satisfaction Guarantee - compare our prices and our superior quality. Click on any natural gemstone faceted bead necklace image below to enlarge it. Item zirj143a: Genuine brown zircon necklace with 58 carats of natural brown zircon beads that are gradational in size measuring 3mm at the clasp up to 3.5mm in diameter at the center of the necklace. Item zirj143ae Genuine brown zircon necklace with 72 carats of natural brown zircon beads that are gradational in size measuring 3.5mm at the clasp up to 4.5mm in diameter in the center of the necklace. This beautiful necklace of natural color red garnet faceted beads was hand-crafted from natural garnet crystals that were mined in Africa. These gem quality garnets were hand-ground into beads which were then hand-faceted, drilled and strung with a sterling silver clasp into these 18 inch long faceted red garnet necklaces. There are 110 transparent purplish-red almandine garnet beads in this genuine garnet necklace, many of which are completely eye-clean! The photo at left shows a close-up. 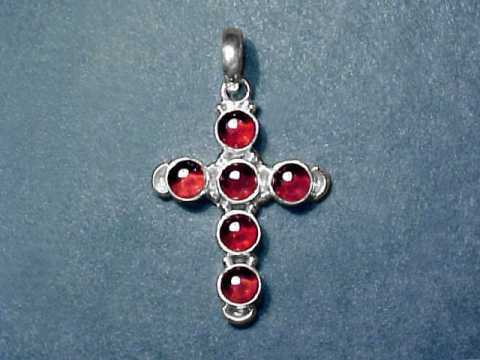 See also a full-view photo of this natural red garnet jewelry design. We do have faceted gemstone bead necklaces available in a variety of other natural gemstones, you can see them displayed on our page displaying Faceted Gemstone Bead Necklaces. This beautiful necklace of natural black spinel faceted beads was hand-crafted from 100% natural black spinel crystals that were mined in Africa. These opaque spinels were shaped into rounded, disk shaped beads which were then faceted & polished, drilled and strung into this wonderful black spinel necklace with a sterling silver clasp. These shiny black spinel beads sparkle very nicely. Item spij139a: Natural black spinel necklace measuring 17.5 inches long with 55 carats of faceted black spinel beads that are 3.5mm in diameter. Item spij139aa: Natural black spinel necklace measuring 18 inches long with 85 carats of faceted black spinel beads that are 4.25mm in diameter. Item spij139i: Natural black spinel necklace with an adjustable length from 17.5 inches long to 18.5 inches long, with 185 carats of faceted black spinel beads that are 6mm in diameter. Item aquj126aa is 18 inches long with 77 carats of faceted aquamarine beads measuring 5mm in diameter. Item aquj126ae is 18 inches long with 130 carats of slightly gradational size faceted aquamarine beads measuring from 6mm in diameter at the clasp up to 6.5mm diameter in the center of the necklace. Item aquj126ag is 18 inches long with 101 carats of faceted aquamarine beads measuring 5.5mm in diameter. 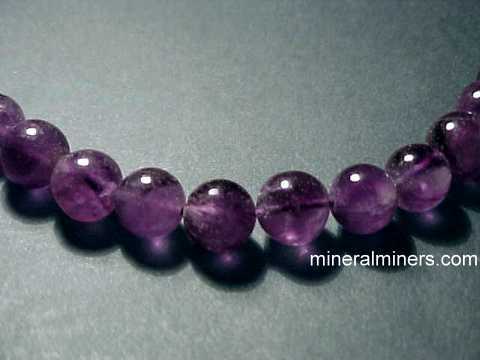 Item iolj142b has 48 carats of natural iolite beads that measure 4mm in diameter. Item iolj142d has 70 carats of natural iolite beads that measure 5mm in diameter. Item iolj142ex - this rare size iolite necklace has 190 carats of natural iolite beads that measure 8mm in diameter! This beautiful hessonite garnet necklace was hand-crafted from natural hessonites that were mined in India. This hessonite necklace has lightly included to eye clean faceted hessonite garnets in a range of all natural colors from light golden to deep orange-brown. The hessonites were faceted into 7mm diameter beads which were then drilled and strung into this 17.5 inch long natural hessonite necklace with a sterling silver clasp. The photo at left shows a close-up view. See also a full view of this genuine hessonite garnet necklace. Natural color amethyst pieces were shaped and faceted by hand, and then drilled and strung in this 17 inch long genuine amethyst necklace with a 3 inch long sterling silver extender & clasp. These beautiful amethyst beads are lightly included to eye clean, and they have wonderful medium dark purple natural color. This natural amethyst jewelry design is unheated and untreated! There also is a 2.5mm faceted amethyst bead strung between each of the larger faceted amethyst beads which are gradational in size, measuring 8mm long at the clasp and increasing up to 10mm long in the center of the necklace. The photo at left shows a close-up view. See also a full view of this genuine amethyst jewelry design. Natural amethyst necklace with 225 carats total weight faceted amethyst beads! Natural color amethyst pieces were handground and faceted, and then drilled and strung in this 17.5 inch (45cm) long genuine amethyst necklace with a sterling silver clasp. These lightly included amethyst beads have beautiful medium-dark purple natural color. 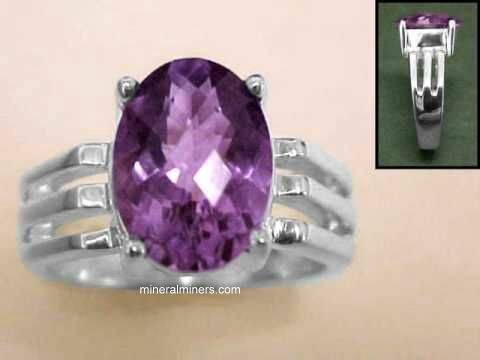 This natural amethyst jewelry design is unheated and untreated! There are 225 carats of hand-faceted beads in this untreated amethyst necklace! The photo at left shows a close-up view. See also a full view of this genuine amethyst jewelry design. This natural blue kyanite necklace has lightly included faceted beads with 100% natural blue color, and they are transparent! The beads in this genuine blue kyanite necklace have not been heated or treated in any way. Natural kyanite pieces with rich blue natural color were hand-ground, faceted and polished into large oval beads which were then drilled & strung in this beautiful 17.5 inch long blue kyanite necklace with a sterling silver clasp. There are over 50 natural color blue kyanite beads in each of these wonderful blue kyanite necklaces! We have this blue kyanite bead necklace available in a 17.5 inch length with 93 carats of oval faceted beads that are gradational in size ranging from 6mm long at the clasp up to 12mm long at the center of the necklace, and then back down to 6mm again. This faceted blue sapphire necklace was hand-crafted from natural color blue sapphire crystals (unheated and untreated!) that were mined in Sri Lanka (Ceylon), Africa and India. These semi-transparent sapphires were ground into rounded disk-shaped beads which were then faceted, polished, drilled and strung in this genuine blue sapphire necklace with a sterling silver clasp. The photo at left shows a full view. See also a close-up image of this natural blue sapphire necklace. Item sblj110ai This 18 inch long faceted blue sapphire necklace has 50 carats total weight of natural blue sapphire beads that are slightly gradational in size ranging from 3mm at the clasp up to 4mm at the largest diameter. Item sblj110axl This 18 inch long faceted blue sapphire necklace has 88 carats total weight of natural blue sapphire beads that are gradational in size ranging from 3.5mm at the clasp up to 5.5mm at the largest diameter. Please see below to order these faceted blue sapphire necklaces. This genuine faceted sapphire necklace was hand-crafted from natural transparent sapphires that were mined in Madagascar. These beautiful sapphire beads are lightly included to eye clean. The colors range from light to dark in shades of blue, pink, green, and white (colorless). These natural sapphires were ground into rounded disk-shaped beads which were then faceted, polished, drilled and strung into this genuine sapphire necklace with a sterling silver clasp. See also a full-view image of this beautiful multi-color faceted sapphire necklace. We have this multi-color sapphire faceted bead necklace available in a 19 inch length with 49 carats total weight of faceted natural sapphire beads that measure 3mm in diameter - this necklace also has a 2 inch long sterling silver extender so it can be up to 21 inches long. Item spej115ee Natural mandarin garnet necklace with faceted beads that are gradational in size ranging from 2.5mm at the clasp up to 5mm at the largest diameter, and then back down to 2.5mm again, with 58 carats total weight of natural mandarin orange garnet beads. Please see below to order. See also our entire inventory of faceted gemstone bead necklaces. 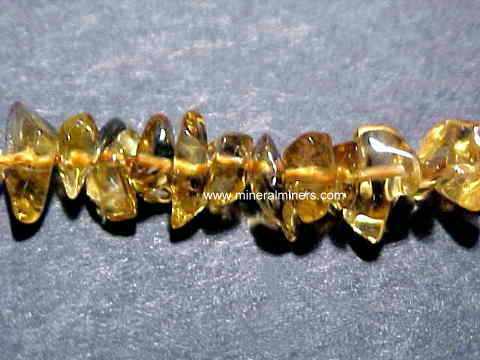 Item apaj105ae is 17.5 inches long with 67 carats of natural apatite beads that measure 4mm in diameter. 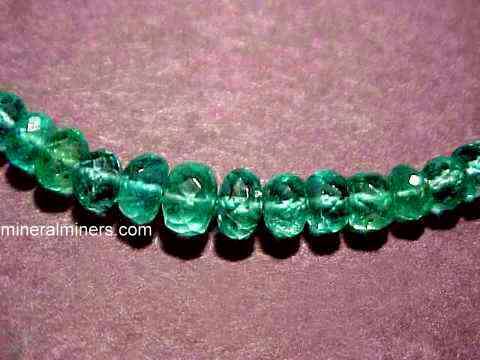 Item apaj105g is 18 inches long with 112 carats of natural apatite beads that measure 5.25mm in diameter. This genuine rubellite necklace was hand-crafted from natural color pink tourmaline crystals with very beautiful fine reddish pink natural color & gem-grade transparency! Each of these superior grade pink tourmaline beads is transparent and clear, they range from very slightly included (VS) to completely eye clean! These natural color rubellite tourmalines were shaped into rounded, disk shaped beads which were then faceted, drilled and strung into this 17.5 inch long pink tourmaline necklace with a 925 sterling silver clasp. The rubellite beads are gradational in size, measuring from 2.5mm in diameter at the clasp up to 5mm in diameter in the center of the necklace, and they weigh 48 carats total weight! The photo at left shows a close-up view. See also a full view image of this natural pink tourmaline necklace. We also have faceted gemstone bead necklaces available in a variety of other natural gem materials including amethyst, iolite, aquamarine, labradorite, and sunstone! Natural tourmaline necklace with 60 carats of semi-transparent faceted beads! This genuine tourmaline necklace is 18" long with 3.8mm diameter beads! This natural tourmaline faceted bead necklace was hand-crafted from genuine tourmaline crystals with all natural colors in shades of pink, green, and blue. These semi-transparent natural color tourmalines were mined in Brazil. They were shaped into rounded, disk shaped beads which were then faceted, drilled and strung into this 18" long natural tourmaline necklace with a sterling silver clasp. The tourmaline beads average 3.8mm in diameter, and they weigh 60 carats total weight! The photo at left shows a close-up view. See a full-view image of this beautiful tourmaline necklace. We also have faceted gemstone bead necklaces available in a variety of other natural gem materials including emerald, blue sapphire, ruby, morganite, mandarin orange garnet and tanzanite! Natural tourmaline necklace with 30 carats of transparent faceted beads! This genuine tourmaline necklace is 17.5" long, with 2.75mm diameter beads! This natural tourmaline faceted bead necklace was hand-crafted from rare quality transparent tourmaline crystals with all natural colors in shades of pink, green, orange, gold and blue! These are very beautiful natural color tourmalines that were mined in Brazil. They were shaped into rounded, disk shaped beads which were then faceted, drilled and strung into this 17.5" long natural tourmaline necklace with a sterling silver clasp. The tourmaline beads average 2.75mm in diameter. These natural color tourmaline beads are lightly included to eye clean! The photo at left shows a close-up view. See a full-view image of this genuine tourmaline necklace. We also have faceted gemstone bead necklaces available in a variety of other natural gem materials including necklaces of pink sapphire, blue sapphire necklaces, aquamarine necklaces, green tsavorite garnet necklaces, blue kyanite necklaces, and spinel necklaces! Natural tourmaline necklace with 65 carats of transparent faceted beads! This genuine tourmaline necklace is 17.5" long, with 4.5mm diameter beads! This natural tourmaline faceted bead necklace was hand-crafted from rare quality transparent tourmaline crystals with all natural colors in shades of pink, green, orange, gold, brown and blue! These beautiful beads are all natural color tourmalines that were mined in Brazil. They were shaped into rounded, disk shaped beads which were then faceted, drilled and strung into this 17.5" long natural tourmaline necklace with a sterling silver clasp. The tourmaline beads average 4.5mm in diameter. These natural color tourmaline beads are lightly included to eye clean! The photo at left shows a close-up view. See a full-view image of this genuine tourmaline necklace. Natural tourmaline necklace with 96 carats of transparent faceted beads! This genuine tourmaline necklace is 18" long, with 5mm diameter beads! This natural tourmaline faceted bead necklace was hand-crafted from rare quality transparent tourmaline crystals with all natural colors in shades of pink, green, orange, gold, brown and blue! These beautiful beads are all natural color tourmalines that were mined in Brazil. They were shaped into rounded, disk shaped beads which were then faceted, drilled and strung into this 18" long natural tourmaline necklace with a sterling silver clasp. The tourmaline beads average 5mm in diameter. These natural color tourmaline beads are lightly included to eye clean! The photo at left shows a close-up view. See a full-view image of this genuine tourmaline necklace. Item tsvj101ie: Natural color green garnet necklace with 36 carats of natural tsavorite green garnet faceted beads that are gradational in size ranging from 2.25mm at the clasp up to 4.5mm at the largest diameter in the center of the necklace. Item tsvj101xaa: This rare size natural color green garnet necklace has 79 carats of natural tsavorite green garnet faceted beads that are gradational in size ranging from 3.75mm at the clasp up to 6mm at the largest diameter in the center of the necklace! The tsavorite mint green garnet beads in these rare and beautiful green garnet necklaces are completely natural with fine medium green color. See also a full view photo of this natural tsavorite green garnet necklace. We also have natural gemstone faceted bead necklaces available in several other types of natural gem materials. Item tanj149a has 43 carats of natural tanzanite beads that are slightly gradational in size ranging from 3mm in diameter at the clasp up to 3.5mm in the center of the necklace. Item tanj149e This rare size tanzanite necklace has 85 carats of natural tanzanite beads that are gradational in size ranging from 3mm in diameter at the clasp up to 8mm in the center of the necklace! 8mm Tanzanite Faceted Bead Necklace! This beautiful necklace of natural black tourmaline faceted beads was hand-crafted from 100% natural black tourmaline crystals that were found in Brazil. These opaque tourmalines were shaped into rounded, disk shaped beads which were then faceted & polished, drilled and strung into this black tourmaline necklace with an adjustable length from 17.5 to 18.5 inches long using its sterling silver extender clasp. The photo at left shows a close-up view, see also a full view photo of this faceted bead black tourmaline necklace. These shiny black tourmaline beads sparkle very nicely. These are all untreated natural tourmaline beads with no dyes, no fillers, and no epoxies! They are 100% natural tourmaline beads, and when examined closely they show occasional natural pits & cracks. We have this faceted bead black tourmaline necklace available with 150 carats of faceted black tourmaline beads that are gradational in size measuring 5mm at the clasp and increasing in diameter on up to 7.5mm in the center of the necklace. This is the end of our Natural Gemstone Faceted Bead Necklaces page. See also our Natural Gemstone Bead Bracelets, our Natural Gemstone Cross Jewelry, and also our webpage displaying Gemstone Bead Necklaces with rounded beads. We have many other unique styles of natural gemstone jewelry in stock including natural Tourmaline Necklaces. Would you like us to inform you when we add on this page more necklaces of natural color gemstone faceted beads? We have a large inventory of genuine faceted gemstone bead necklaces in stock, so be sure to let us know if you have a faceted gemstone bead necklace special request. Please contact our webmaster or our 'site' geologist with any questions or comments.